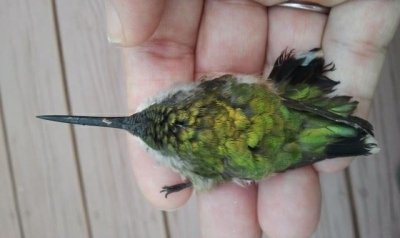 One August afternoon, I came home from work to discover three hummingbirds on my screened-in porch. The wind had blown the door open next to one of my feeders and the birds flew in by accident. Two were bumping against the skylight, chirping frantically and trying to escape. I was able to carefully catch them, one at a time, in a fishing net and release them in the backyard. They seemed indignant, but no harm was done. The third hummer was another matter. He was hanging onto the screen, and I would never have seen him had he not been right by the door. He was pitiful, and had, apparently, completely depleted his energy reserves in his desperate bid for freedom. He chirped a little when I examined him so I took him out in the backyard and placed him in the crook of a tree near a feeder. I checked back periodically but he didn’t fly away. At this point, I posted the saga on my Facebook page and asked for advice on saving the little fellow. It took less than 30 minutes to get my answer. I count among my Facebook friends several DNR associates – I spent 10-plus years in Public Affairs with Georgia DNR’s Wildlife Resources Division. Melissa Cummings, who works in the Public Affairs office, fired off a quick email to Terry Johnson, another friend and retired chief of what is now the division’s Nongame Conservation Section. Terry responded that I needed to refuel the little creature by gently dipping the tip of his beak in some sugar water, being careful to dip it in briefly so the bird could breathe. I retrieved the bird from the tree. He wasn’t looking so hot but he chirped a bit when I picked him up. At first he resisted the nectar, but within a minute or two he started drinking it. I could see his tiny little tongue lapping at the liquid, but I was careful to remove his beak frequently so he could breathe. I could literally feel him returning to life in my hand. His heart started racing and he became more active, though he did not particularly fight me holding him. I snapped a few pictures with my phone. The whole refueling process took no more than 15 minutes. After a final dip in the nectar, he took off and landed in a nearby tree. It was a neat experience to hold one of these tiny creatures and even more rewarding to see him fly away. I was also very thankful that my Facebook post resulted in the answer of how to revive the little guy. At last count, I also had 19 comments and 66 “likes” for my post. That may be a record for me! Dottie Head is a former DNR Wildlife Resources Division employee and freelance writer who lives in Milton. Her work has appeared in Georgia Sportsman and other publications. Terry Johnson's “Out my backdoor” column runs in the first issue of Georgia Wild each month. Green salamanders are not considered common wherever they are found. But discoveries in Floyd, Walker and Chattooga counties revealed that these lungless sallies are found in more areas of Georgia than previously thought or described in literature. 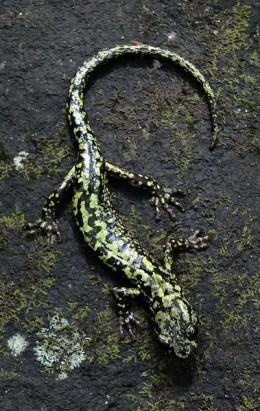 The state range of green salamanders, listed in Georgia as rare, had included only the northwestern and northeastern tips – respectively, the Cumberland Plateau and the Blue Ridge and upper Piedmont. That is, until Brett Tyler and Nate Thomas were monitoring vegetation for DNR at Rocky Mountain Recreation and Public Fishing Area last summer. Tyler, a Berry College graduate, had mentioned seeing what he thought were green salamanders while doing spider research at the area near Rome. Thomas, who familiarizes himself with rare species in areas where he works, knew the description fit green salamanders. He also knew that besides being a candidate for listing under the federal Endangered Species Act, this salamander species wasn’t supposed to be at Rocky Mountain, which is in the Ridge and Valley Province – between the Cumberland Plateau and Blue Ridge provinces, or ecoregions. When their work took them near habitat on Rocky Mountain that looked promising – moist rock outcrops and boulders creased with cracks – Thomas began looking. “We ended up finding six, overall,” he said. He later found green salamanders at other sites in the Ridge and Valley: Johns Mountain Wildlife Management Area, between Dalton and Rome on the Chattahoochee National Forest, and a private site near Summerville. Surveys could document new sites for the rare amphibians and explore possible connections between the Cumberland Plateau and Blue Ridge populations – considered genetically different from each other. Now a Nongame Conservation Section employee, Thomas worked with senior biologist David Gregory of DNR’s Game Management Section to write a management plan for Rocky Mountain. A moderate-sized lungless salamander that grows up to about 5.5 inches long. Named for green lichen-like patches along back. The only bright green salamander in the U.S.
Usually found on or near shaded rock outcrops in moist forests. Also found in nearby trees, sometimes high in canopy. Nests and hibernates in deep rock crevices. Eats small insects, spiders, snails and slugs. Preyed on by small snakes. Returns to hibernate in rock outcrops in October. Because of toe pads, regarded as best climbing salamander in the eastern U.S.
Population declines in the Blue Ridge noted since the 1970s. Factors may include habitat loss, climatic factors, disease and over-collecting. Like other lungless salamanders, depends on skin for gas exchange. Lungless salamanders can be key indicators of air and water pollution. Sources include “Amphibians and Reptiles of Georgia” (UGA Press). Interested in helping with research focused on wildlife and the outdoors? Citizen-science projects available on the web vary from star counts to frog call surveys. Many are open to children and teens, as well as adults. All promote data-gathering aimed at better understanding the environment. The goal of some is conserving animals, plants, insects and natural habitats. For Anna Yellin, the opportunities are rich, particularly for children and teens. “They can choose what they would be interested in, and then they can follow that interest,” said Yellin, environmental review coordinator with DNR's Nongame Conservation Section. She teamed with agency botanist Dr. Mincy Moffett this spring to help teach Oconee County seventh-graders about web-based conservation information. Moffett explained key sites. Yellin covered ways to put the information into action. As a mother of three, it’s a topic close to home. It’s also an area where the Internet offers a world of possibilities. Yellin listed more than 30 sites, including SciStarter, which catalogs hundreds of projects in which participants help study everything from ants to the ocean floor. There’s even a road kill project (led by Dr. Splatt). You don’t have to be an adult to do something to help. Citizen-science projects depend on volunteers to gather and report data for scientific analysis. The data can help researchers understand long-term and widespread changes in wildlife populations and the environment. As pointed out in this year’s Give Wildlife a Chance Poster Contest (themed “Everyone can be a citizen scientist”), the Audubon Christmas Bird Count is touted as the longest-running citizen-science project. Started in 1900, the annual count is still going strong. 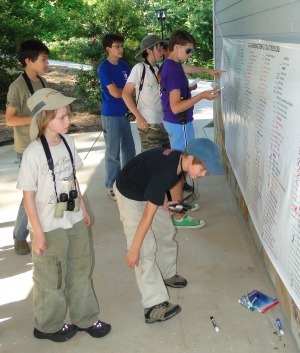 Bird lovers flock to citizen-science projects sponsored by the Cornell Lab of Ornithology. DNR is involved in some citizen-science programs that classes can join in, such as Adopt-A-Stream. For the young (and young at heart), the Museum of Science's Firefly Watch is a natural. Email Anna Yellin for a list of citizen-science websites that focus on monitoring animals, plants and insects, or understanding the Earth, its seasons and climate change. This article wraps up the three-part series Rare Wildlife 101, which focused on web-based educational conservation information and efforts. Parts I and II profiled key websites for local, national and international rare species and natural habitat data. As always, we welcome your comments and questions. A seven-fold spike in July’s average number of bottlenose dolphin strandings has prompted NOAA Fisheries to declare an Unusual Mortality Event in the mid-Atlantic region. Through Aug. 20, 221 dead or dying dolphins were documented from Virginia to New York. Strandings are also increasing along North Carolina’s Outer Banks. Why hasn't been determined. But some of the dolphins tested positive for morbillivirus. The infectious pathogen was implicated in a mass die-off in the late 1980s that killed about 740 dolphins -- and possibly many more -- from New Jersey to Florida. Strandings have not increased in Georgia this summer. But Nongame biologist Clay George is concerned the disease could spread south as migratory dolphins return to Georgia waters this fall and winter. "It's important that beachgoers, boaters and others report all sick and dead dolphins to DNR immediately," George said. "Doing so will help us learn more about the potential impact to dolphin populations." Report a stranding in Georgia: 1-800-2-SAVE-ME (1-800-272-8363). Video news coverage. Photos. Hellbenders are making headlines. 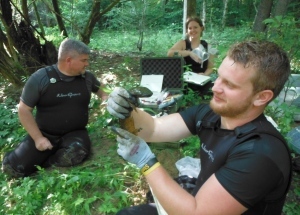 Coverage includes a post in the Smithsonian National Zoo blog Salamander Science that follows Nongame biologist Thomas Floyd in north Georgia streams, plus a report in The Wall Street Journal on Bronx Zoo efforts to boost eastern hellbender populations in New York. Loggerhead sea turtles keep on keeping on. Nest totals topped 2,260 this week, at least 20 more than last year’s count, which had been the record since comprehensive surveys began in 1989 (“Loggerheads top nest record,” Aug. 13). The result, writes DNR Sea Turtle Program Coordinator Mark Dodd, is “more than twice the long-term average and closely approaches the recovery goal for Georgia of 2,800 nests.” Track totals. The five whimbrels tagged in Georgia with satellite transmitters are on the move (“On the trail of whimbrels,” May 31). At last check, Wolf had flown nonstop about 3,300 miles from Arctic breeding grounds to the British Virgin Isles and then on to Puerto Rico; Ossabaw and Postel were hanging out in South Carolina; Cabretta was near Cape Fear in North Carolina; and, Mackay was still in the Arctic. Nongame biologist Tim Keyes suggests these Southeastern birds are worth watching – all are likely heading to South America. Women who want to learn about the outdoors, from watching birds to hunting bucks, should check out the Becoming an Outdoors-Woman workshop Nov. 8-10 at Charlie Elliott Wildlife Center, less than an hour south of Atlanta. No experience is necessary, and the weekend program is geared to women of all ages and fitness levels. Outdoor learning is in store for teachers at the 2013 Outdoor Learning Symposium by the Environmental Education Alliance of Georgia. The event is Oct. 4 at Oatland Island Wildlife Center in Savannah. If Gmail is shuttling your issue of Georgia Wild to the Promotions tab, where it's easier to miss, here's how to make sure the newsletter ends up in your Primary tab, where it's easier to see. Left-click on the email in the Promotions tab. Drag and drop it in the Primary tab. Click "Yes" when the box pops up asking if you want to make the change permanent. Future emails from the Georgia Wild address will go to the Primary tab. Dr. Elsa Haubold is the new national coordinator for the U.S. Department of the Interior's Landscape Conservation Cooperatives. The network's job is better integrating science and natural resource management to tackle climate change and other landscape-scale issues. 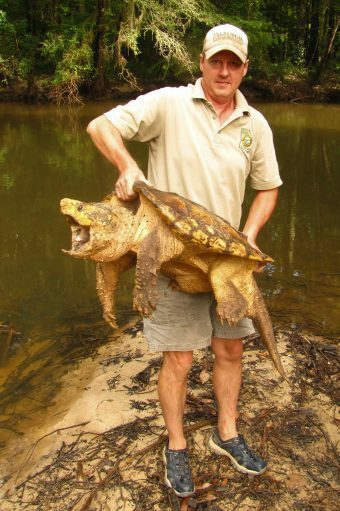 turtles live much longer than what has been documented before. 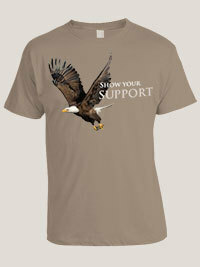 Buy a new eagle plate or renew your current eagle or hummingbird tags.